...Things are easy when you're big in Japan...."
Food fashion comes in waves and over the past two decades at least Japanese cuisine has become big all over the world. Always on the pricy side in London, we were thrilled to come across it a few years ago while holidaying in Rio de Janeiro, Brazil where the influence from the land of the rising sun is much in evidence. There was a wonderful Japanese restaurant near our hotel on Ipanema Beach which had a fantastic value "all you can eat menu" every lunch time. We went there every single day and devoured mountains of sushi, sashimi and teriyaki. It made our stay there! Teriyaki is a cooking technique used in Japanese cuisine in which foods are usually broiled, grilled or pan fried in a sweet soy sauce marinade. Fish such as tuna, trout, salmon and mackerel along with meats like chicken, pork, and beef are very suitable for this cooking method. In this post we suggest salmon but the recipe could easily be adapted for any of the other fish or meats listed above. 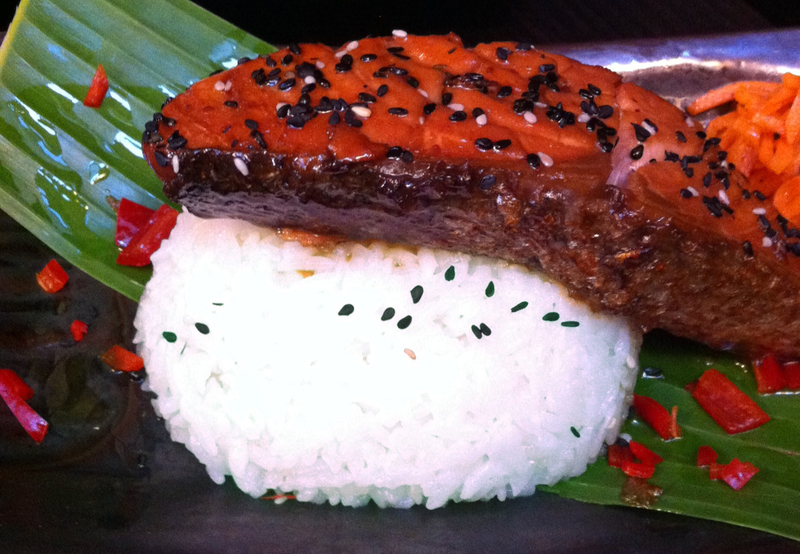 The salmon is paired up here with sushi rice but noodles or salad would be excellent too. Black and white sesame seeds and/or chopped chilli for garnish. Combine sauce ingredients in a saucepan over a medium heat for 2 or 3 minutes until sugar has dissolved ant the marinade has thickened slightly. Remove from heat and allow to cool. Cover salmon with liquid for several hours in the fridge if possible. Remove fish and reduce liquid marinade over medium heat until it reaches a syrupy consistency. Heat a non stick pan until lightly smoking. Add a little light cooking oil and place fish on pan skin side first. Most of the cooking should be down with the skin side down as this protects the flesh. Turn over the fillets for a minute to finish off. Skin should be crispy and is delicious to eat. Place on a serving dish, drizzle over the Teriyaki reduction and sprinkle with sesame seeds and/or chopped chilli for colour and garnish. Combine all ingredients apart from rice and water in a small saucepan. Heat until sugar is dissolved. Leave to cool. Rinse rice until water runs clear add to the water in a saucepan and bring to boil and reduce heat to low simmer and cover for 20 minutes. Rice should be tender and water absorbed. Allow rice to cool enough to be handled and put in a wide vessel. Add the syrup little by little while folding the rice gently. At this point don't worry about the texture of the rice it will dry out quite quickly.